Mohamed Attaoui in Morocco. Photograph: Daniel GrushkinIn early March, just days after the Kingdom of Morocco announced plans for a landmark environmental charter called “the first commitment of its kind in Africa and the Arab world“, Mohamed Attaoui was sentenced to two years in prison in the Atlas mountains. His crime? Speaking out against illegal logging of shrinking cedar forests and corruption among the ranks of the forest service and local government officials. While other major religions, such as evangelical Christianity, are beginning to find a place for an environmental ethic in their people-centric preachings, the political turbulence of the Muslim world threatens the longevity of their spectacular ecosystems, from Iraq’s marshlands to the rainforests of Sulawesi. That’s why we need to support to a new generation of daring, eco-minded muckrakers like Attaoui, who are bringing some semblance of transparency to the most far-off corners of the world. Attaoui lives in the town of Tounfite, tucked into a valley at the base of Morocco’s highest mountains, where he runs a tiny NGO out of his garage called “L’Association Avenir pour le Cèdre et le Mouflon” – the association for the preservation of cedars and the bighorn sheep. It doesn’t exactly roll off the tongue, but then again Attaoui is a homegrown activist who has supported the operation with his own money and contributions from other concerned locals. No one taught Attaoui how to be an environmentalist, and, well, it was hard to hold my tongue when I watched him bury a sardine tin in the woods or capture a hedgehog on the road and haul it 30 miles to his backyard. That’s not to say his heart is not in the right place, particularly when it comes to cedar. Morocco’s forests are protected at a national level because they are key to capturing its limited water supply and reducing erosion from its arid valleys. Roy Hagen, a forestry expert who has worked for USAID in the region, says that government foresters have been involved in illegal logging for decades but no one has done anything about it. At least until 16 February when Attaoui started naming names. He published an exposé in the local paper, Al-Monataf, that tracked the movements of illegally felled logs by government officials, whom he named the “cedar mafia”. On 8 March, two plainclothes officers stopped Attaoui on his way home from work, handcuffed him and said he was being arrested for possession of hashish, a charge Attaoui denies. It would be days before his wife and children learned what happened and before Attaoui even learned of the formal charge against him: extortion. 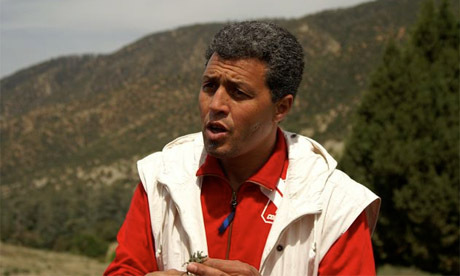 A whistleblower in the forestry service who Attaoui had interviewed had lodged the claim earlier that day, perhaps – Attaoui believes – to prevent the axe from falling on his own head. Despite an audio record of the conversation Attaoui had with the whistleblower at his own home, he was summarily declared guilty and was facing up to two years in prison when Reporters Without Borders stepped in with legal help. His sentencing has been pushed back multiple times this summer, but it seems like the gavel may finally fall on 20 September. With it, the international community can finally judge whether Morocco means what it says when it comes to the environment. For his part, Attaoui is hardly chastened. When I visited him with fellow journalist Daniel Grushkin, he had been out of his prison cell for a little more than a week. He led us up a steep stream where fresh stumps were still powdery with sawdust. A couple of logs had been felled by prohibited chainsaws, but not yet hauled away. “Encore un désastre!” he shouted. He launched into a verse from the Qur’an about the conversations of the birds and the trees. “The trees eat, they breath, they even speak,” he said in French. Hopefully, the faithful will start listening. Previous Declare Jihad/Crusade on Jeremy Kyle and Chavistas! Next Are 20% Americans Baptist Taliban?